Cue the Christmas music. It's officially (in my home anyway) the Christmas season. I love the Christmas season for so many reasons. 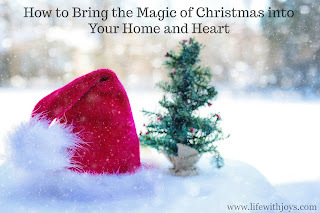 I decided a few years ago that I was no longer waiting until after Thanksgiving to start bringing the wonderful Christmas feel into our home. There is something magical about the season that makes our home feel so much more comfy and cozy. I know that this season is hard for some people. I can totally relate because I really struggled for a few years with feelings of depression during the holidays. The holidays left me feeling lonely and, honestly, like something was wrong with me. My heart goes out to anyone who feels this way. It is a terrible guilt that we often leave bottled up inside. We all have our reasons for the sadness the holidays can bring on. Mine had to do with my biological father. You see, we never had a relationship. When he died, I was left feeling so sad and empty. I had always dreamt of him telling me he loved me and he was proud of me. His death was a death for my dreams too. The holiday season exasperated my pain and caused me to grieve for a relationship that never would be. Christmastime is a time for families, for love, and for children to feel the magic of it all. I guess the little girl in me broke when I realized that I would never hear "I love you" or "I'm so proud of you". After a few years of struggling, I made a conscience decision to be purposeful in my thoughts. I decided that I was no longer going to let something I could not control wreak havoc on my time with my children and family. While it still hurt, I didn't want the holiday season to be tainted by my broken heart. If my heart was going to be repaired and I was going to enjoy the season, I had to let go and trust God to lead me in love. I had to take every thought captive and turn it into praise for Jesus and all that He does for me. I decided that I could wallow in my sadness or recognize all the blessings God places around me. I began keeping a blessings journal and I was amazed at what all I began to notice! Trust me when I say that a blessings journal is a sure fire way to see the love God has for us. To overcome the holiday blues I did a variety of things. I kept a blessings journal - I wrote down everything I noticed throughout the day - no matter how small. I turned on Christmas music and sang loudly. I wanted to put the song into my heart! I found others to bless. It's funny how blessing others blesses us a million times more. I made Christmas cookies and handed them out to anyone who would take them. I spent time with others I knew were struggling. I wanted to show them God's love and let them know that they weren't alone. I aloud them to be authentic, cry, and release what was on their hearts. I was purposeful about finding joy in shopping for gifts. I didn't let it become a have to. I rewarded myself often with a trip to a coffee shop. I don't claim to know the depths of people's hurting hearts, but I do know that sharing love and kindness always helps - if even for a short time. Let's be open and purposeful about showing love to those around us this holiday season. A loving, kind, and listening heart is so much better than a store bought gift. If you know of someone who is hurting, make time to love on them and let them know that they matter.